From USA Today bestselling author Julianne MacLean comes the next instalment in her popular Color of Heaven series. Since her magical summer romance at the age of sixteen, Sylvie Nichols has never been able to forget her first love. Years later, when she returns to the seaside town where she lost her heart to Ethan Foster, she is determined to lay the past to rest once and for all. But letting go becomes a challenge when Sylvie finds herself transported back to that long ago summer of love…and the turbulent events that followed. Soon, past and present begin to collide in strange and mystifying ways, and Sylvie can’t help but wonder if a true belief in miracles is powerful enough to change both her past and her future…. "I never know what to say about a Julianne MacLean book, except to say YOU HAVE TO READ IT. I always find myself very introspective after reading one of her books and The Color of Time was no exception... In the end, Sylvie's story ends up the way it was meant to be, but she and the reader take a wonderful, heartbreaking, mysterious path to get there. It's so difficult to discuss much about this book without divulging spoilers, so I'll just reiterate what I said at the beginning. YOU HAVE TO READ THIS BOOK." 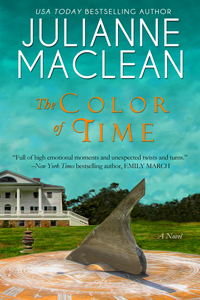 "The Color of Time is an emotionally charged, riveting exploration of how our lives may change within the scope of a single event. And sometimes what we want isn’t always what we need. Fabulous, thought-provoking read." “Julianne MacLean knows what her audience likes...compelling characters and a soul-baring journey of love."